Now, this is a big big section – because there are lots of changes, improvements, and innovations going on here. So much so that I’ve to add one of those “read…” options otherwise the post would take up the whole of the page. What’s really new is stuff like support for a Software-based FCoE adapter (along the same lines as the iSCSI Software Adapter except it needs the supported NICs to work properly), the implementation of VASA (along side improvements to its big brother VAAI), a new files system in the shape of VMFS5, as well as the release of a Virtual Storage Appliance (VSA). Although not included in the core vSphere SKU, and sold separately – VSA is mentioned in the VCP blueprint that inspired this series of posts. In addition to these features VMware also added Datastore Clusters, Storage Profiles and Storage DRS. Phew! A lot to get your teeth into – as well as updating any knowledge gaps in vSphere4.1 as well as refreshing your brain cells on the stuff you thought you knew, but have forgot since your last VCP test! VMware now recognise there are in fact three models for delivering iSCSI functionality to the ESX host – with Software iSCSI initiator, hardware based iSCSI-HBA, and also iSCSI enabled-NICs from enabled from the main server BIOS. VMware now clearly state that they prefer a physical separation of the iSCSI storage network, from the rest of the network – but they will of course, support standard VLAN tagging as way of achieving the same result. Two separate vSwitches – with physically different vmnic – each with a VMKernel Portgroup on it. 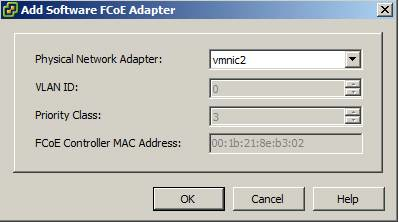 One vSwitch backend with multiple vmnic’s. First portgroup (say called IP-Storage1) would use say vmnic1 as its “Active” adapter, and vmnic2 would be marked as an “Unused Adapter”. 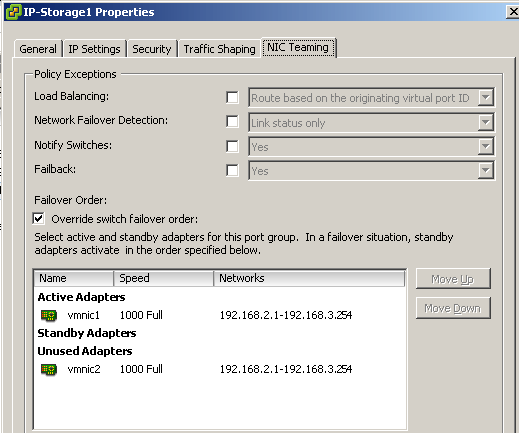 The Second portgroup would (say called IP-Storage1) would have configure that would be the opposite – with vmnic2 marked as “Active” and vmnic1 marked as an “Unused Adapter”. Basically every VMKernel port has its own dedicated vmnic in either method. 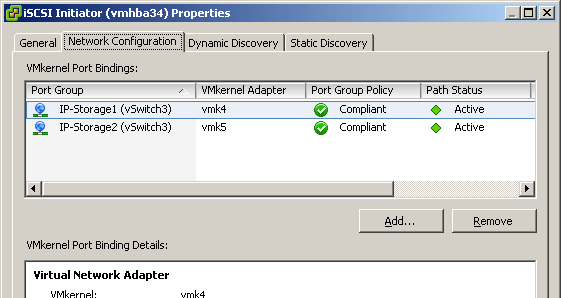 You can add the VMKernel Ports that are valid for “iSCSI Port Binding”. For this to work you must configure only one vmnic per its own dedicate vSwitch – once added and initialised the software adapter will discover the VLAN and Priority Class. Now fully supports “Linked Clones” which you see in products like VMware View and vCloud Director – as well as fully supporting VMs which snapshots attached to them. SvMotion now has new copy engine which creates a “bitmap” of the blocks that have changed during the SvMotion process as well as process that allows the “mirroring of blocks” and “split writes” – so when a VM is “in flight” both the source and destination are update with any changes. SvMotion no longer use change-block tracking typically used by backup vendors – and these new methods of tracking and controlling writes should improve the overall performance of SvMotion. Introduce in vSphere4, vSphere5 introduces three new primitives to the set. The first merely extended the “Copy Offload” primitive to NFS, where previously it was only available to block based storage using VMware VMFS file system. So as such as its not a new feature, more that its better supported than previously releases. The copy offload feature stops the blocks of the VMDK being read-down from the array to the host, and then written-up to a different volume/LUN on the same array. A good example of this situation is if you have LUN/volume for your “templates” from which you read, and destination LUN to which write when you create a new VM. A lot of process which look like moves are actually copy/delete processes and so copy-off load does have benefits elsewhere. What’s really new is support for primitive called “Thin Provision” stun. This warns the administrator when a volume is becoming over-committed by more thin-virtual disks than the LUN/Volume has actual capacity for. The intention is to try to avoid an out-of-free space condition. VASA (Sphere Storage APIs for Storage Awareness) apart from adding an even great number of confusing acronyms beginning with a V – VASA is the little brother to VAAI. VASA allows storage vendors to add plug-ins to vCenter – which then reports on the functionality of your storage. Some have their providers as part of a virtual appliance (Dell) or as vCenter-side software that installs as service (NetApp). I’ve written at some detail about them on my old RTFM Education blog. You can take these basic catagories – and create profiles on them. These profiles then show up in dialog boxes that affect the placement of VMs – say when you create a new VM, clone a VM or clone from a template to create a new VM. It designed to create an advisory system where VM Admins are given guidance on where to place their VMs. You can also create you own user-definitions without the use of VASA. VASA/Storage Profiles allow you to edit the settings of individual VMs, and indicate where the .VMX and VMDK files are located – and just like with “Host Profiles” there’s a compliance feature – that allows to scan your VMs to see if they comply with the Storage Profile. So in some respect you can see them as kind of “policy” with the only caveat being that they only offer advice – they don’t force a VM Admin to select particular type of storage. So its more an “advisory” system, than a “policy” system. Datastore clusters allow you to group individual datastores together to create one cluster of storage. You can see it like a bunch of ESX being stuck inside a VMware DRS cluster – which allows you to aggregate the CPU/Memory resources of the host into a single entity. The same is possible with datastore clusters – and just as with VMware DRS - fundamentally a VM winds up on a specific host on a particular datastore. Datastore Cluster are part and parcel of Storage DRS which controls where the VM gets placed on power (as VMware DRS does for server compute), and can also move a VMs .VMDK files from one datastore to another. SDRS has two sets of criteria for initial placement – space and latency to a datastore within a Datastore Cluster. Whereas the decision to move a VM from datastore to another within a datastore cluster is based on latency only. The condition on free space is checked once every 5mins, whereas the condition on latency is checked once every 8hrs by default – both of these intervals are configurable. Turning on SDRS also turns on the Storage IO Control (SOIC) feature (that now supports NFS) that is used to calculate the latency afflicting a VMs VMDK files. As with VMware DRS there is a Storage Maintenance mode – that can be used to evacuate a datastore of all the VMs, before some kind of maintenance tasks such as removing the data store from the cluster. As with VMware DRS there affinity and anti-affinity modes – but these differ subtly from those settings. 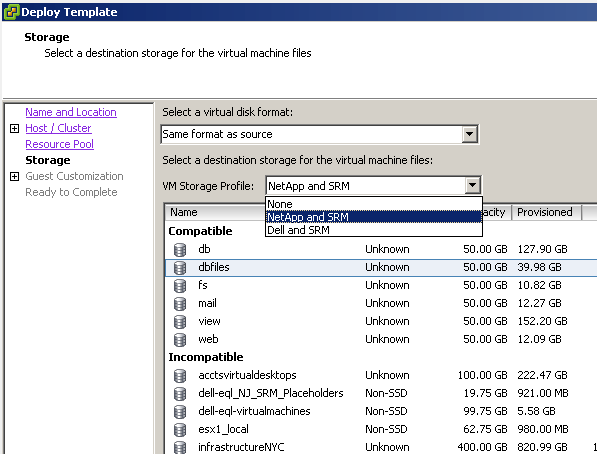 It’s possible to indicate the files of VM are “kept together” to they always reside on the same datastore with in a datastore cluster (affinity) or must be “Be Separate” – there’s also VM-to-VM affinity and anti-affinity rules where you say a rule exists to keep two VMs files together or apart. SDRS is compatible with all the big features such as snapshots, RDMs, and it also supports NFS as a datastore type. However, its not supported on ESX4, and its recommended that if your storage array supports some type of “auto tiering” by which volumes/LUNs can be moved to different tiers of storage (SATA, SAS, SSD) that you only enable the initial placement feature of SDRS, and leave it to the array to balance between cold, warm and hot spots of IO. Finally, a word of caution. Backup remains a disk intensive activity – and therefore its recommended that use the schedule feature of SDRS to exclude any activity from it during the backup window. 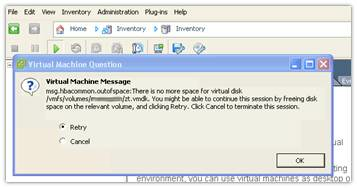 VMware have introduce a new filter that allows you to see from the vSphere Client if you storage is SSD backed. Non-SSD devices are labelled “Non-SSD” whereas NFS mount-points are labelled “Unknown”. VMware have entered the storage game! They have developed a storage virtual appliance which sits on top of vSphere. Although not part of vSphere and sold as separately product – don’t be surprised if you asked question about it on the VCP. Some of those questions will assume you have set it up and played with it an anger – as they will ask you about various stuff you see in dialog boxes and management windows. You have been warned! VMware refer to the VSA as “Distributed Array of Storage” in that each ESX host runs a virtual appliance, and has a replica of the data held elsewhere. Should one of the virtual appliance fail, their is copy of the data held on one of the peers in the cluster. 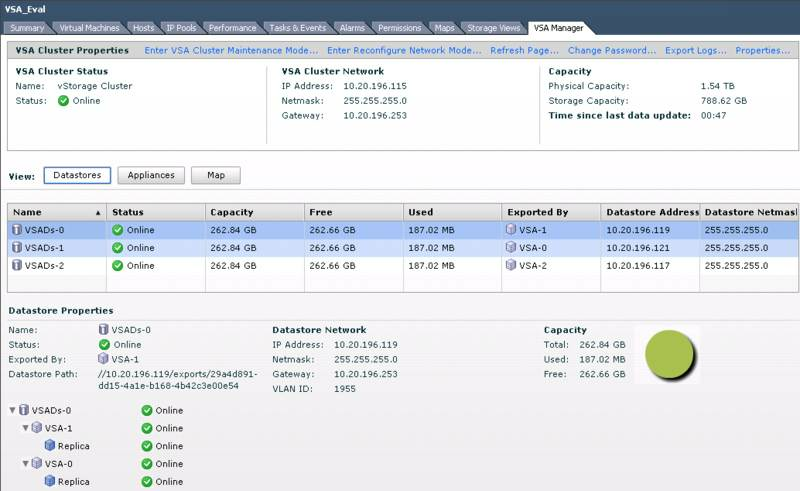 VSA is NFS only for the moment, and the way its is setup depends on the number of ESX host you have. The virtual appliance essentially “shares out” the local storage of the ESX host. VMware recommend a RAID1+0 configuration via the local controller. VMFS3 is still available for mixed environments that contain both ESX4.x and ESX5.x hosts. In terms of upgrading – its possible to upgrade from VMFS3 to VMFS5 without the need to power off or Storage vMotion VMs – but some of the parameters of the original format – such as the block size.